Reporting is useful where other teams are relying on you and management can see your progress. In addition, we want to be pro-active rather than reactive. When I first started as a product manager, often stakeholders wanted to know what was happening. By reporting on a regular basis, I’m now on the front foot. I really like this weekly format which I’m going to share with you. 1. Goals over activity: In the past, I summarised all the activity that was going on. This is not useful information to stakeholders. They can see that you are busy and it takes time to parse. What they care about is how you are progressing towards your goals. 2. 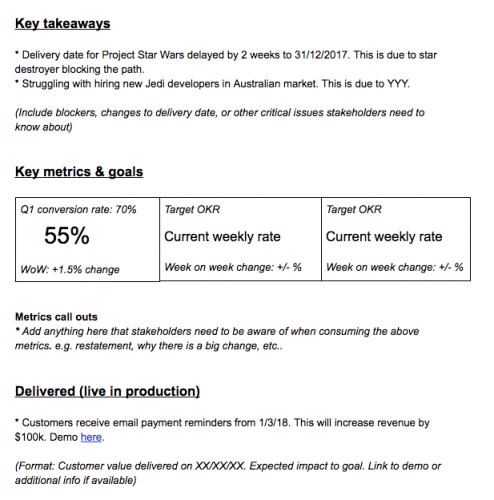 Focus on 1 – 3 key goals: Personally, I like to focus on 1 OKR (Objective & Key Result) and report on that. The objective is your goal and key result is your metric. Focus young padawan! What you have 3 goals or 5 goals, which one do you focus on? Sometimes these are competing as well. I’ll show you how to report on your goals. You really have to think about who the audience is which in my case would be management. This includes head of mobile, head of product, management team of mobile, other mobile teams, heads of other products. Similar to the above, we want to turn all the knowledge/activity that we have into useful insights to these stakeholders. They don’t have time to parse through everything that is going on. What key takeaways do we have? We want to show what we have learnt. One of the hardest things I have learnt is to be concise. Get to the point. If you have any additional info, you can link out to it so they can read it. I use bullet points and condense it down to 1 line (or a few short lines). If its less than 3 months out, I provide a specific date. It doesn’t matter that its not 100% accurate, I’m giving an indication when it will roughly land. Since I’m updating it weekly, I can adjust it as new information comes out. If its greater than 3 months out, I’ll provide a month when it will drop. The cadence I previously used was every two weeks. A few months ago we switched to a weekly basis. I like the weekly reporting cadence because it ensures I check my key metrics on a weekly basis at a minimum. I can also see the week on week change. I have to consider “What am I doing on a weekly basis to make a change?”. Once you know the format and general principles, it becomes easy to update. It does take a while to get into the weekly cadence and how to do it efficiently. But I’ve come to like it as it keeps me accountable and I can raise issues on a timely basis if needed. The 1 page format I’ve been using is detailed below. 1. Summary: High level points that stakeholders need to know about. This may be the only part that they read. 2. Metrics: I report on 1 OKR. It shows the key result we are targeting, the weekly metric and the % change week on week. 3. Delivered: What has been delivered in the past week. 4. In progress: What we are working on. 5. Coming off the backlog: Things we are planning to do in the next 2 weeks to 2 months. Stakeholders can provide feedback on these items e.g. they have a different priority. Here is the 1 page template I have created in google drive. You can find it here. I had to screenshot it as 2 images below. You could have each team do this report. Another method is to get all the streams to condense it down to 1 report. This is what we have been doing in our teams. So each team or stream adds a subheading within each section. Its a rollup of the streams that are related. So this concludes how I report weekly to stakeholders. I would like to give credit to my current and former managers, Joff Redfern and Jonathan Zazove for introducing this reporting format and helping me become a world class product manager. I hope this helps you in your journey. Feel free to copy the template and make it your own!